The biggest gap between stationery Points of sale and e-Commerce often is the lack of advision. This gap can be filled using our premium plugin "Shopping Advisor". 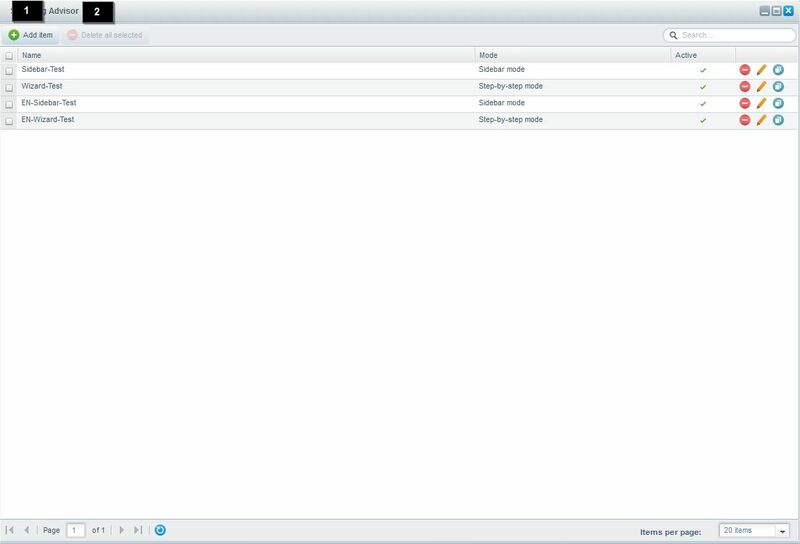 After the plugin was installed you have to reload your backend, so the plugin is integrated in the menus. It may be needed to clear the config cache and then reload the site. 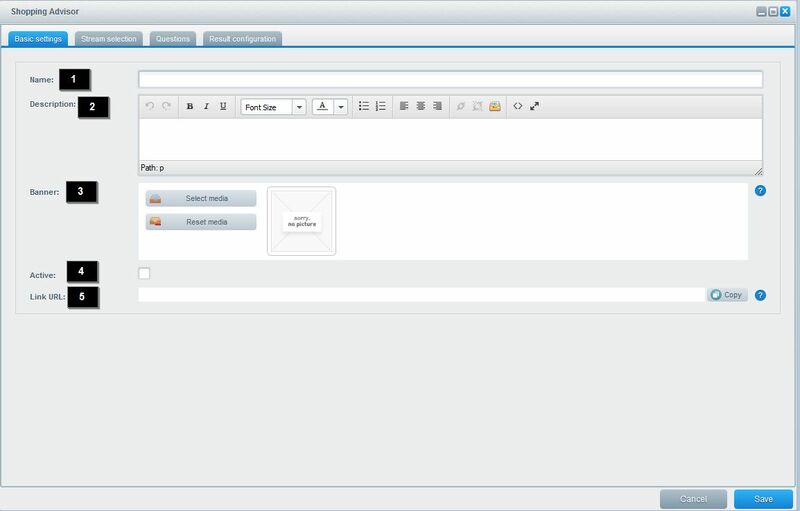 Afterwards the plugin can be found below the menu entry "Marketing". 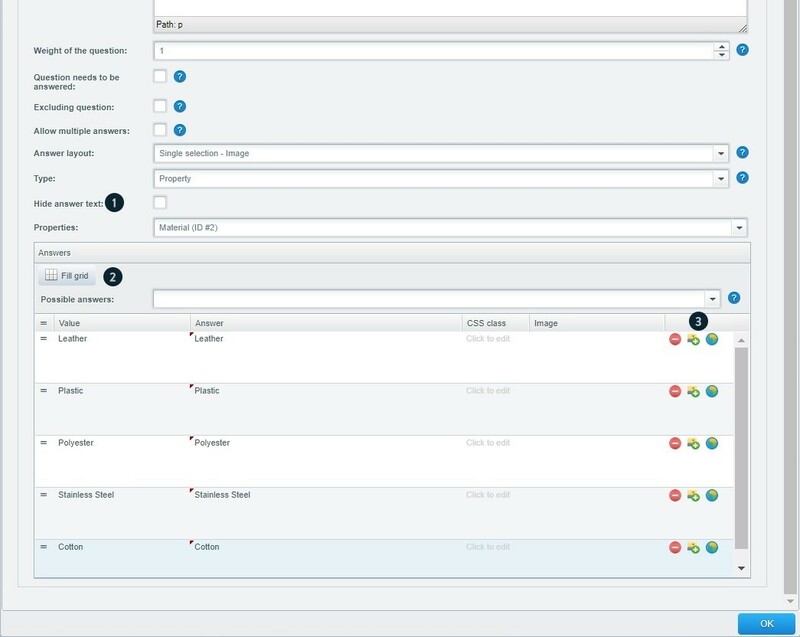 After loading the plugin you can see an overview of all currently existing advisors. When opening this overview for the first time it will obviously be empty. Accordingly you got the options to create new or delete existing advisors. The step-by-step advisor finds its results in single steps, based on a visual supported display of the questions. Instead of simple questions it is possible to use emotional pictures. In the frontend it works this way: First your customer can answer question after question or jump between different questions. 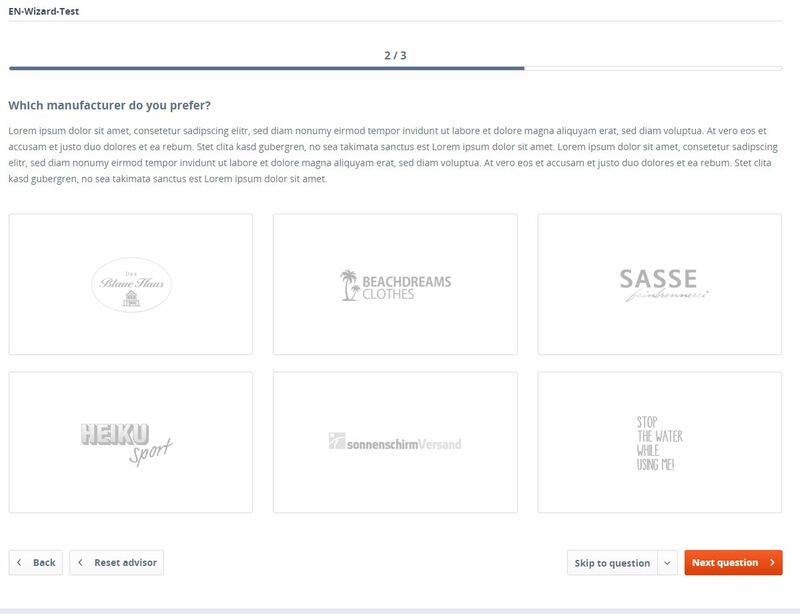 Each question will have an own page, at the end your customers will see a result page based on their choices. When you create a new advisor and already chose an advisor type, the following menu will open. This is parted in the tabs "Basic settings", "Stream selection", "Questions" and "Result configuration". Name (1): Here you enter the name of the advisor, the name will also be used for the advisor's link. Description (2): This description will be shown at the start of the advisor. Banner (3): Here you may set a banner which will also be displayed at the beginning of the advisor. Active (4): This option activates or deactivates the advisor. Link URL (5): Using this link you can reach the advisor. At this place you can see and copy the url, after you saved the advisor for the first time. All changes in the tabs of this module can be saved using the "Save" button or drop them using the "Cancel" button. 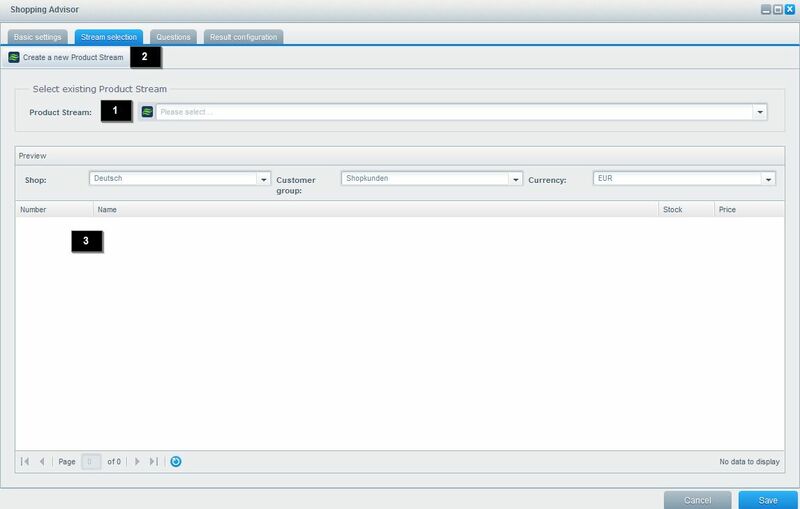 Before you can save the advisor, you have to configure additional options in the tabs "Stream selection" and "Result configuration"
The results shown in the plugin "Shopping Advisor" are based on Product Streams, which were introduced in Shopware 5.1. They provide the base selection of products available in the advisor. Product streams ensure, that your advisor will stay up to date, without taking care of each and every advisor manually. The only thing required are well maintained products. 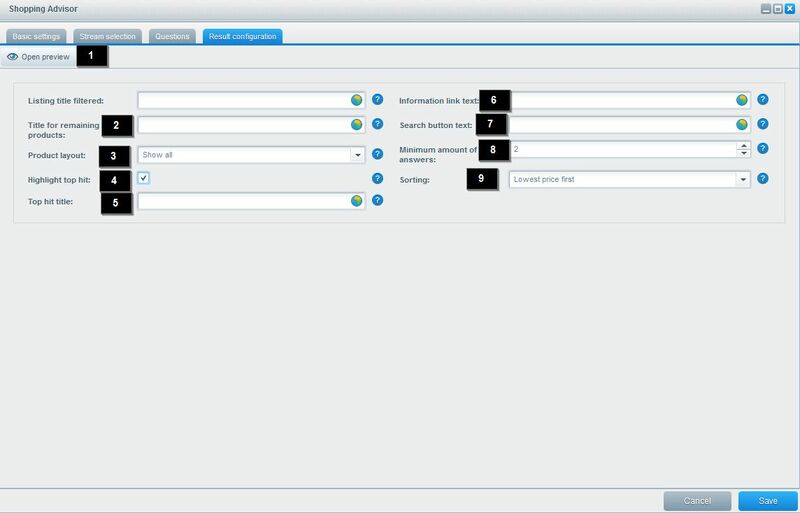 So here it is possible to select a product stream, which provides the advisor's base. For this you select one of the streams at "product stream" (1), which you want to use for the advisor. If you did not already create the desired product stream (2), you may do so clicking "Create a new product stream". 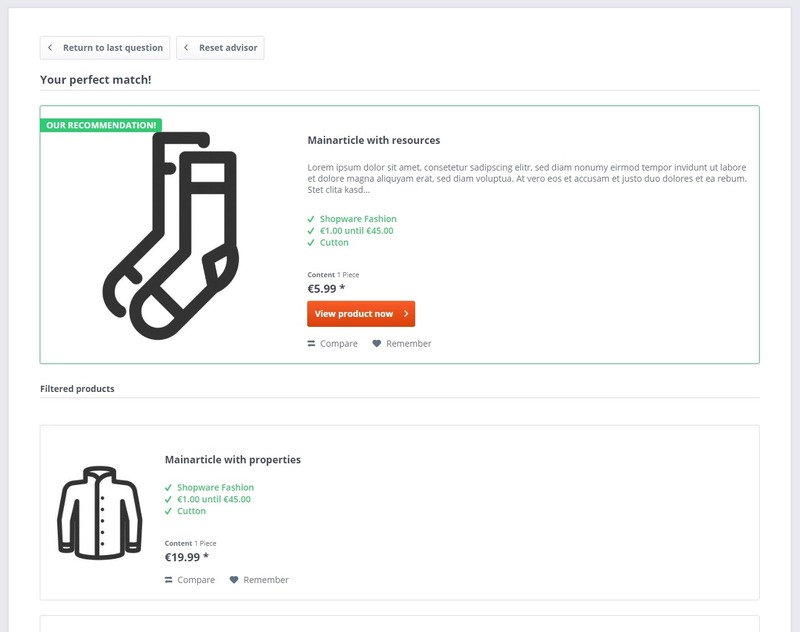 After you selected the desired product stream, the included items (3) will be shown in the preview . This is the advisors centerpiece, the questions. This is where the actual advision with the customer happens. If you already created questions these will be shown in the overview. Following the concept already seen in the advisor overview, you may add questions using the button "Add item"(1), or delete existing questions using "Delete all selected"(2). 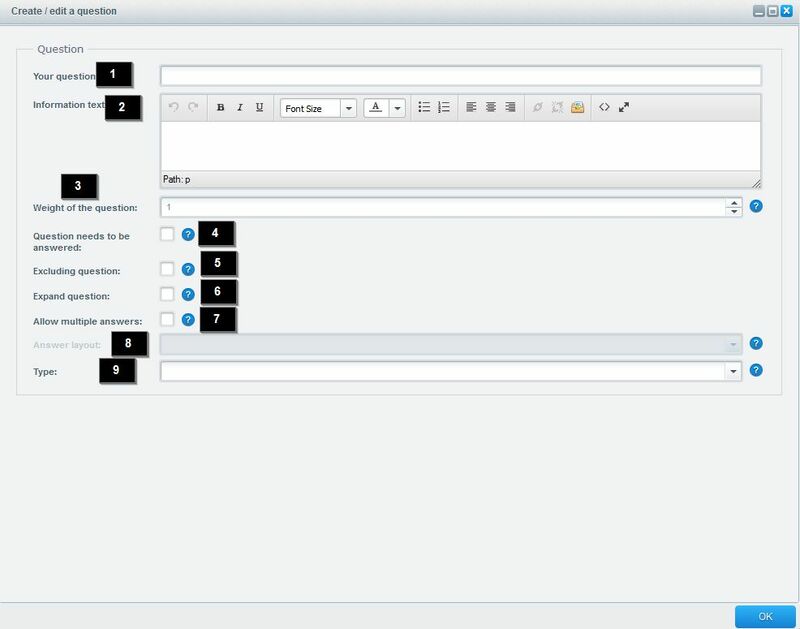 Additionally existing questions can be deleted, edited or duplicated using the icons. The order of the questions can be manipulated via drag-and drop. When you create a new question or edit an existing one, the following module will open. Weight of the questions (3): You can set the weight of the question. Using this the relevance of the answers in the frontend will be increased and matching articles will be displayed earlier. A higher weight leads to a higher position for fitting products. Question needs to be answered (4): Questions with this option are required to be answered by the customer, so the advisor can be finished. Excluding question (5): You can define excluding questions here. This means, that after answering this question, only articles will be shown, which match the question, other articles won't be shown. Expand question (6): This option is only used in the sidebar advisor and manages, if the question is expanded at the start or not. Allow multiple answers (7): This option alows the customer to give multiple answers to one question. Answer layout (8): Here you are able to define, how the answers will look in the frontend. The different option will be explained in detail later on. Type (9): This gives the option to select the type of your question. It defines the areas regarding the question and automatically influences the answers you may create. Further details will be explained in the segment "Question types". Attribute: The answers will be selected from the items attributes. The attribute you want to add needs to be filterable. You can find this setting under Properties > groups > filterable. Property: For this type you can select the answers from the properties available in your shop. Manufacturer: Here you can use the manufacturers available in your shop. Price: Here you can define answers regarding the price of the items. When you create questions of this type, a dropdown will appear, where you can define the actual option, e.g. which property shall be used. Based on this you can select the answers, you want to use in the advisor. Clicking an answer will add it to the area "answers". There you may add different text, assign a CSS-class or manipulate the answers order via drag-and-drop. The selection of answers depends on the articles and available values in your product stream. When creating a price question you may select one of the known answer layouts or a price slider. In the first case you may define values as you wish, for the price slider you define minimal and maximal values. This option is also available for multiselects as " multi selection - text". The looks only differs a bit. 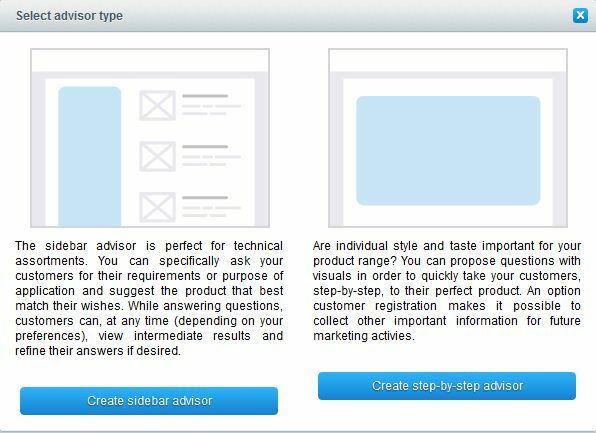 When you create a Step-by-Step advisor, you got the possibility to use another answer layout: "Single selection - Image" provides the option to use a design grid to include emotional imageworlds within your advisor. You got the option to add an image for each answer, additionally you can configure, wether the answer text is shown or not. With the button "Fill grid" you open the editor, which you can use to alter the layout of the answers. Add row (1): Adds a row to the grid. Remove row (2): Removes a row from the grid. Number of columns (3): Sets the number of columns in the grid. 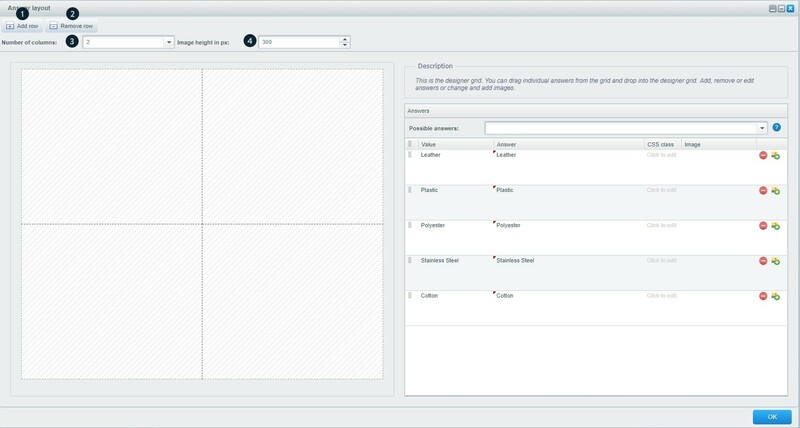 Image height in px (4): Defines the height of images in the grid. Your answers can easily be assigned to this grid. The answers can be found on the right side of the window and will be assigned to the grid via drag and drop and also can be changed in order. You may also add new answers or edit existing ones in this menu. In your frontend the question will look like this, chosen answers will be marked with a checkmark. You got the possibility to alter the layout and texts of this listing. Open preview (1): Opens a preview to check the current settings. Title for remaining products (2): This sets the title for products without hits. 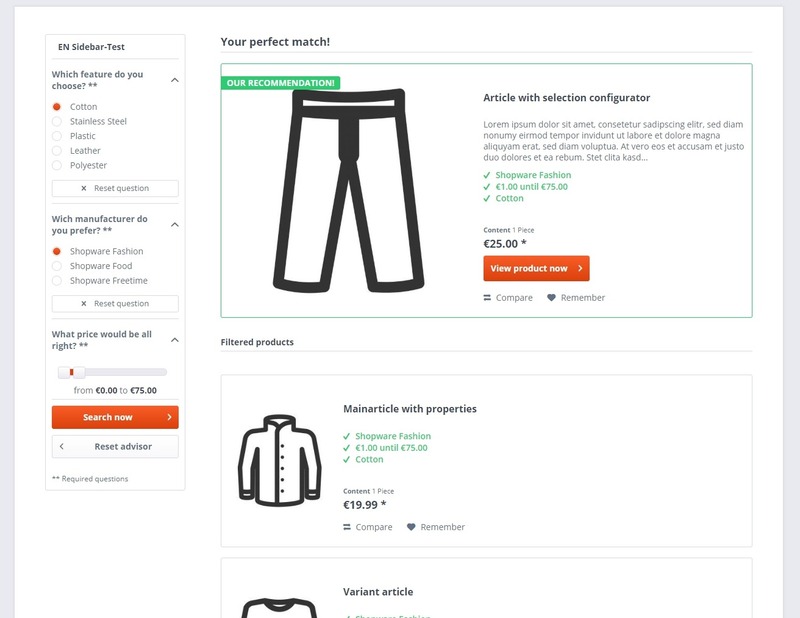 Product layout (3): This alters the listing layout, further information can be found in the segment "result listing". Highlight top hit (4): Highlights the highest rated hit. Top hit title (5): Specific title for the top hit. Information link text (6): Defines the text for the information link. This link shows the description of a question in a sidebar advisor. Search button text (7): Defines the text for the search button. Sorting (9): Sets the sorting which is used as a third factor after hits and weight of questions. If you define no texts, default texts will be used. If you use the premium plugin "Advanced Promotion Suite", you have to consider the following: Discounts from this plugin will not be considered in "Shopping Advisor". It may occure, that the sorting of hits will not be displayed correctly. At "product layout" you may select between different layouts. Each layout includes a small image of the item and a short description of the layout. The layout "Display matches" shows the matching properties in the listing. "Show all" displays all properties, those matching and not matching. The following three layouts are the layouts known from normal categorie listings. In the preview you can check your advisor, including results and their sorting. 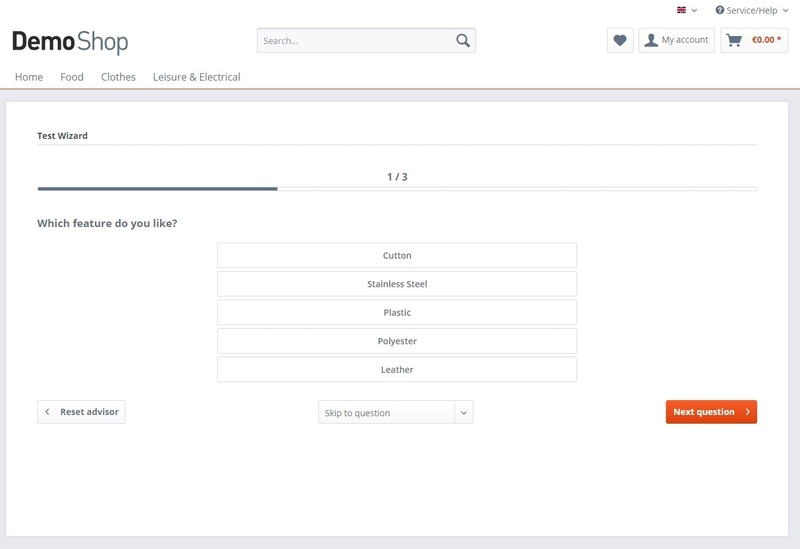 For this you can answer the questions on the left side and after a click on "Show products" the results will be displayed. The configured result listing will be displayed to the customer like this. 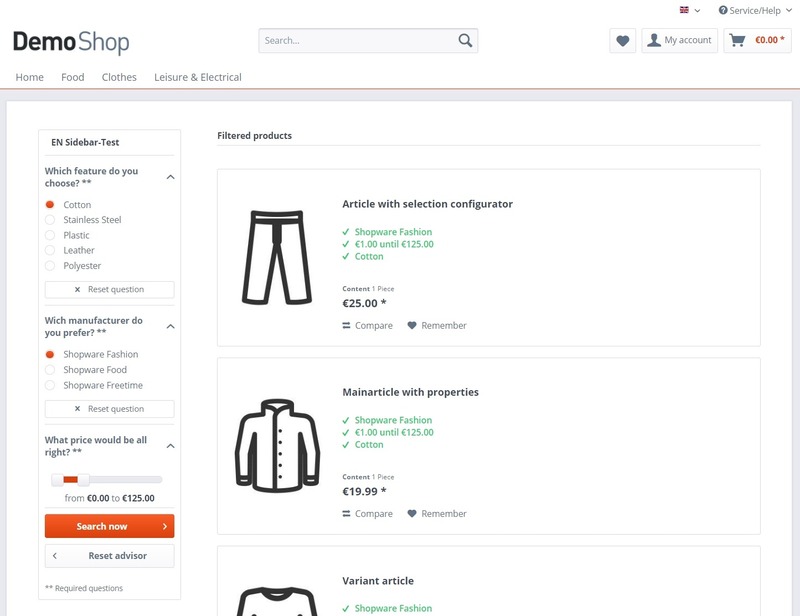 The plugin "Shopping Advisor" saves the advisors of your customers in the shop. Accordingly, a registered customer can benefit from the fact that his advisor, including his results, is saved in a user. He can therefore call up an advisor again at a later point in time via the link. Even if a customer is not logged in, his advisor can be called up again later via an alphanumeric value attached to the advisor's link. So the customer can pass on his advisor with his own answers via the link to a friend, for example, who can then see the answers and add them if necessary.